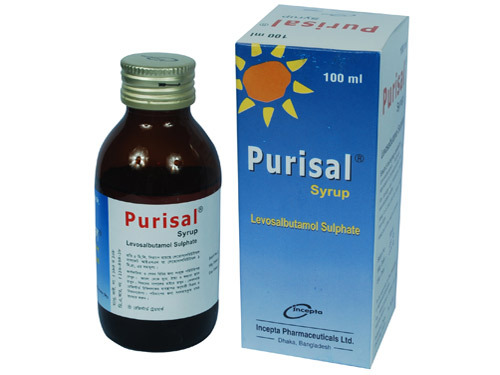 Purisal 1: Each tablet contains Levosalbutamol Sulphate INN equivalent to Levosalbutamol 1 mg.
Purisal 2: Each tablet contains Levosalbutamol Sulphate INN equivalent to Levosalbutamol 2 mg.
Purisal syrup: Each 5 ml syrup contains Levosalbutamol Sulphate INN equivalent to Levosalbutamol 1 mg.
Levosalbutamol is a single isomer beta-2 agonist that differs from racemic salbutamol by elimination of (S)-salbutamol. Levosalbutamol is an effective bronchodilator whose primary mechanism of action is unimpeded by (S)-salbutamol.Thus, when compared with racemic salbutamol, clinically comparable bronchodilation can be achieved with doses that substantially lessen beta-mediated side effects. 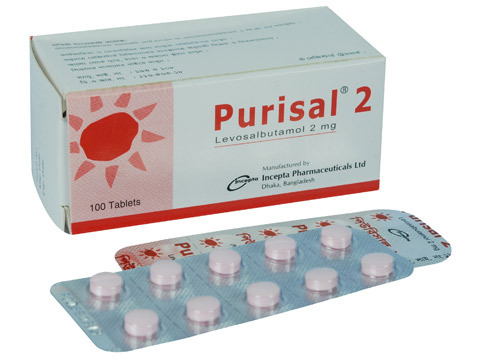 Levosalbutamol produces bronchodilatation through stimulation of beta-2-adrenergic receptors in bronchial smooth muscles, thereby causing relaxation of bronchial muscle fibres. 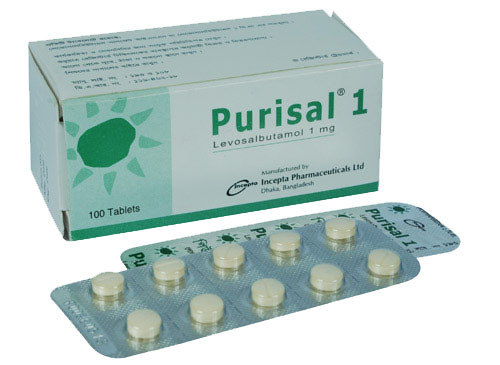 Levosalbutamol is indicated for the treatment and prevention of bronchospasm in adults, adolescents, and children 6 years of age and older with reversible obstructive airway diseases. Children (2 -5 years): Up to 0.1 mg/kg body weight (not more than 1 mg) three times daily. 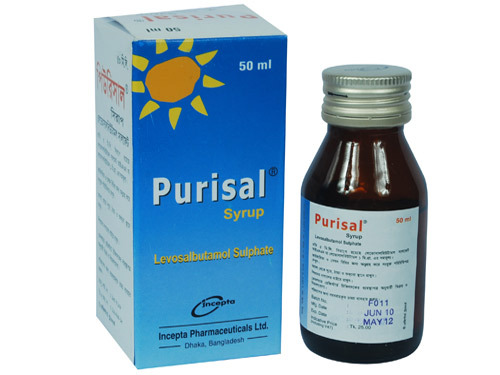 Children (6 -11 years): 5 ml (1 mg), three times daily. Adults and adolescents above 12 years: 1-2 mg, three times daily. Hypocalcaemia, palpitation, fine tremors of the skeletal muscle and muscle cramps may occur. The other likely side effects are nausea, vomiting, burning substernal or epigastric pain and diarrhoea. Particular caution is advised in acute severe asthma as this effect may be potentiated by hypoxia and by concomitant treatment with xanthine derivatives, steroids and diuretics. Serum potassium levels should be monitored in such situations. Pregnancy: The drug should be used during pregnancy only if the potential benefit justifies the potential risk of the fetus. Lactation: It is not known whether levosalbutamol is excreted in human milk. Caution should be exercised when oral levosalbutamol is administered to a nursing woman.